Prototype: German Federal Railroad (DB) class VT 08.5 TEE diesel powered rail car train, as TEE 185 "Paris-Ruhr," with the route Paris – Liège – Cologne – Dortmund. 4-car set in a crimson red basic paint scheme. 1 powered car, road number VT 08 509, with galley and dining area (WRPwPost4üm), 2 intermediate cars, road numbers VM 08 516 and VM 08 518, with compartments (A4üm), 1 powered car, road number VT 08 517, with compartments (A4üm). All the cars were first class. Both powered rail cars have the TEE sign at the ends. The train looks as it did around 1957. Starting in 1952, the new class VT 08.5 diesel powered rail cars came into use on the long-distance express network for the new German Federal Railroad. These three or four-part units impressed people right away with their elegant streamlined shape ("Eierkopfe" / "Eggheads") and they had a galley, dining area, a writing compartment, and a mail compartment. Starting in 1953, these comfortable trains with their beautiful shape ran on all the important long-distance lines, whereby they accumulated up to 1,500 kilometers / 937 miles daily. Even on the new TEE network introduced in 1957 they had a chance to prove themselves right from the start because the class VT 11.5 powered rail car trains planned for this service were just beginning to be delivered. 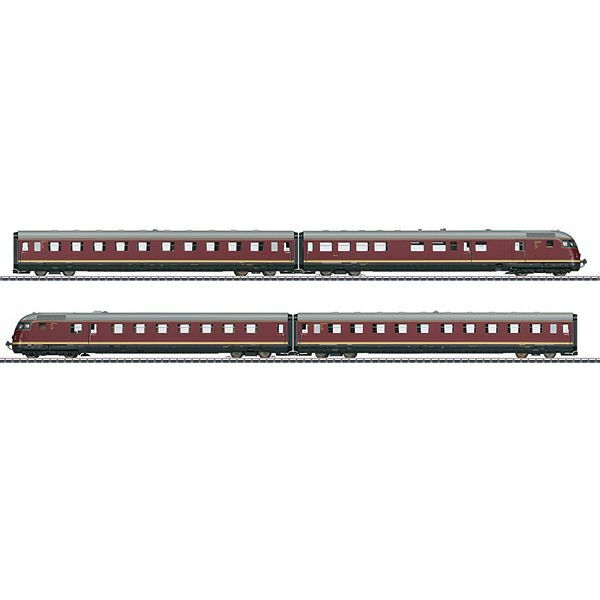 Model: The train is a 4-part unit consisting of 2 powered cars (VT) and 2 intermediate cars (VM). The train has an mfx+ digital decoder and extensive sound functions. Different station announcements, train announcements, and dialogs can be activated by means of function buttons. The train has controlled high-efficiency propulsion with a flywheel mounted in the power car with a galley and dining area. 2 axles powered on one truck by means of cardan shafts. Traction tires. The train has factory-installed interior lighting and cab lighting. The triple headlights and dual red marker lights change over with the direction of travel, will work in in conventional operation, and can be controlled digitally. Maintenance-free, warm white LEDs are used for the lighting. There are special, close couplings between the cars. The train has built-in interior details. There is a clear view through the engineer's cabs on the end cars. The ends of the powered cars have separately applied imitations of prototype couplers and separately applied TEE signs. The power pickup changes with the direction of travel so that the pickup shoe on the powered car at the front of the train is picking up power. Length of the four-part train 114 cm / 44-7/8". Prototypical reproduction of the 4-car TEE powered rail car train TEE 185 "Paris-Ruhr." Powered car units constructed mostly of metal. Controlled high-efficiency propulsion with a flywheel, in one powered car. "World of Operation" mfx+ decoder with a variety of sound functions. Factory-installed interior lighting and cab lighting with warm white LEDs. This model can be found in a DC version in the Trix H0 assortment under item number 22602. Early German Federal Railroad Flagship Train and the Wonder of Bern. The first five sets of the VT 08 express powered rail car trains were available to the German Federal Railroad as early as the summer schedule of 1952. The thoughts given to the new development of diesel powered rail car trains with hydraulic transmissions went all the way back to the foundation of the German Federal Railroad. Thus, thirteen three-unit trains from the first production series were built by 1953 for important long distance express passenger service as part of the new construction program. Another six engine cars with dining car arrangements and seven intermediate cars were added by 1954 in the second production run. These units were used primarily to lengthen the existing trains to four and five-unit consists with powered end cars at both ends. The modern, comfortable VT 08 represented the epitome of the new German Federal Railroad and enjoyed great popularity among the passengers. The smooth rounded form of the ends of the train quickly led to the nickname "Egg Heads." These deluxe trains provided service on long distance routings with sonorous names such as "Rheinblitz," "Munchner Kindl," "Roland," "Schauinsland," or "Saphir." These fast trains were also used on foreign routes such as the "Paris-Ruhr" (Dortmund-Paris) as well as the "Helvetia" (Hamburg-Zurich). The heyday for the VT 08 extended well into the Sixties. After electrification of many major routes, the VT 08 trains were still used partially in TEE service. Later, these trains were rebuilt to simpler standards for plain fast train service.